The 1973 Monaco Grand Prix was a Formula One motor race held at Monaco on 3 June 1973. It was race 6 of 15 in both the 1973 World Championship of Drivers and the 1973 International Cup for Formula One Manufacturers. 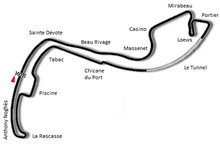 The race was held on a heavily revised circuit, with a longer tunnel, a new section of track around the new swimming pool on the harbour front, and the Gasworks hairpin replaced by the Rascasse and Antony Noghès corners, the latter named after the founder of the race. The pits were also moved back to the start-finish straight, on a wider pit lane. The 78-lap race was won from pole position by Scotland's Jackie Stewart, driving a Tyrrell-Ford. In the process, Stewart equalled the record of 25 Grand Prix victories set by his friend Jim Clark. Brazil's Emerson Fittipaldi finished second in a Lotus-Ford, with Swedish teammate Ronnie Peterson third. This was the first race for future World Champion James Hunt, driving a March-Ford entered by Hesketh Racing. Hunt suffered an engine failure in the closing stages of the race, but was classified ninth. ^ "1973 Monaco Grand Prix". formula1.com. Archived from the original on 3 September 2014. Retrieved 22 December 2015. ^ a b "Monaco 1973 - Championship • STATS F1". www.statsf1.com. Retrieved 19 March 2019.